Next stage will be to make application that will open ad URLs saved in DB and update their entries with final page title and URL. PyQt4 for Windows contains only SQLite driver. If you wish to use other DB on Windows then you will have to use a python driver for it or compile PyQt4 on Windows with the driver. This code will show the app window, but the app won't do anything. There is also a list of webpages to load. self.sites is a list of dictionaries, and every one contains url - to load, and site - site "name" which will be save with ad url. The most important is __getNextUrl method, which returns URL of a webpage to load. self.currentIndex starts from 0 (first element in list), and when the page loads in loadFinished we increment the value and call __getNextUrl again until we hit end of the list. start method attached to "Start" button loads the first page starting the chain. As a helper I used loadProgress to print the progress of page load in the console. The solution is similar. We use self.currentRefresh to hold the current refresh count. In loadProgress we check if it's less than max refresh count (self.refreshSite) - if so we don't increment the self.currentIndex (but only self.currentRefresh) so the same site will be returned by __getNextUrl. If the refresh count reach limit we reset the counter and increment self.currentIndex for the next page. 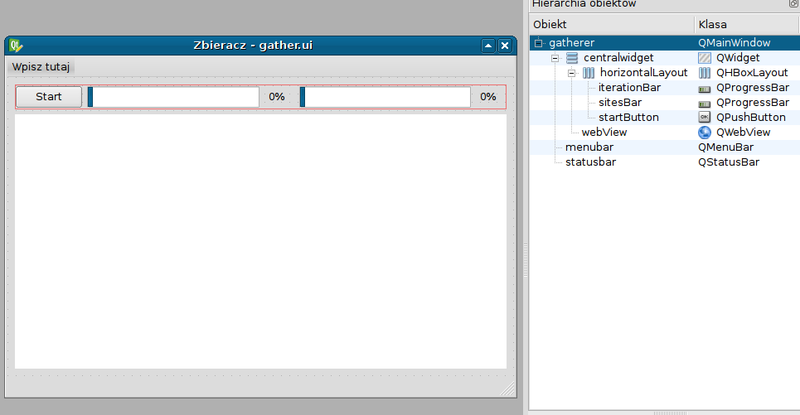 In __getNextUrl I've also added sitesBar and iterationBar progress values.